A Flash In The Pan-Robbie Moore Bursts On The Scene. 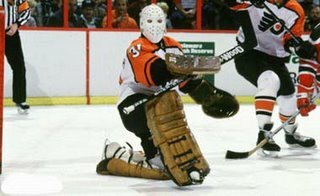 When you think Flyers goalies, you usually think of the clutch brilliance of Bernie Parent, the grace and stellar reflexes of Pelle Lindbergh or the grit and toughness of Ron Hextall. This story focuses on a little goalie who seemed like he could be a star, but whose imprint was small. Robbie Moore.The 5'5" undrafted NCAA product who left dental school to pursue a hockey career set Philadelphia a-titter after Bernie Parent suffered an eye injury during the 1978-79 season. 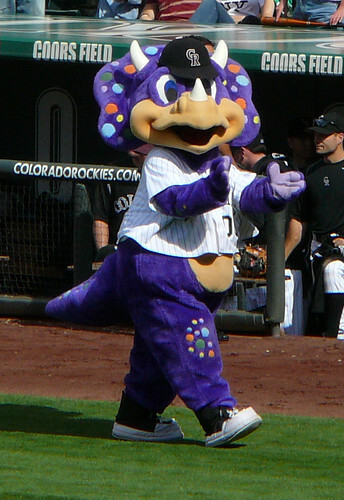 Moore made his NHL debut against the Colorado Rockies. Moore had an opportunity to step in and win a NHL job in the wake of Parent's career ending eye injury. The Flyers had the unhappy Wayne Stephenson, and journeyman Rick St Croix, as well as fellow prospect Pete Peeters. Moore was a minor sensation with fans...However, in the playoffs, Moore was a different story. Moore's playoff run was erratic. He won 3 games, but lost 2. His GAA jumped to 4.03, and his save percentage fell like the stock market, down to .838. 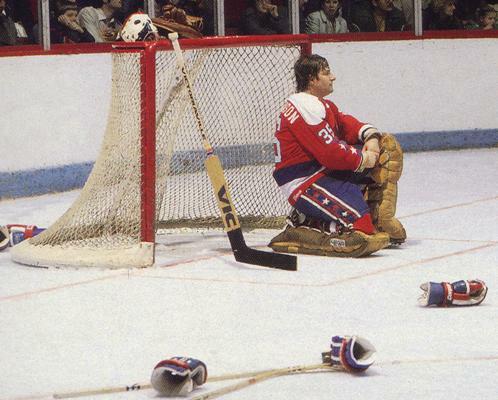 Moore had blown his chance to guard the Flyers net at the Spectrum. 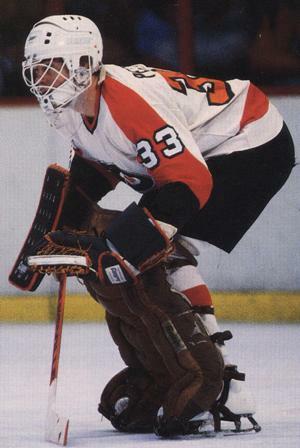 The next season, the Flyers had acquired a new veteran goalie, Phil Myre. 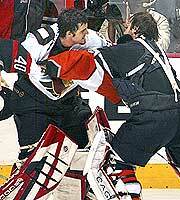 and Peeters had clearly staked his claim to the Flyers net in the future. Moore's window had closed. In reality, the little goalie who starred at Michigan really had little chance to grab the reins and win the Flyers goalie job. Peeters was more touted and went on to have a pretty good NHL career-winning a Vezina for the Boston Bruins and ending his career in an encore for the Flyers. 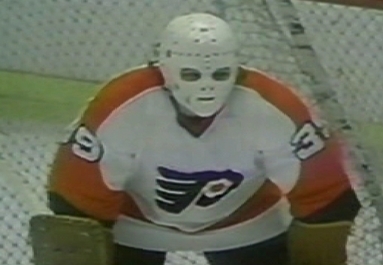 Moore never played for the Flyers again. He played one more NHL game, in 1982-83 for the Washington Capitals. Wayne Stephenson, another former Flyer goalie who played for the Caps. Moore finished his career with the IHL's Milwaukee Admirals in the 1983-84 season. 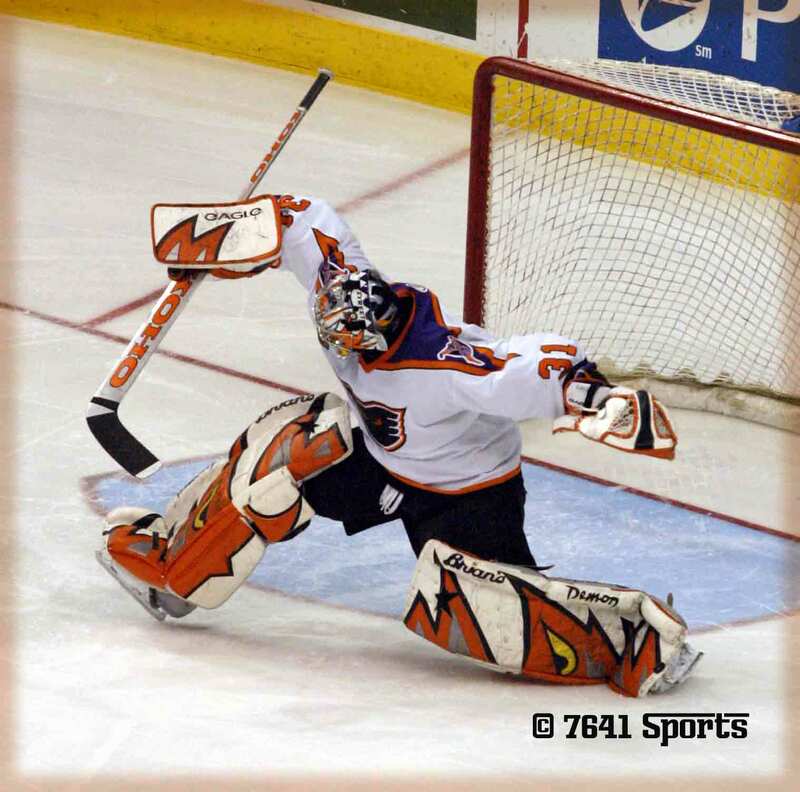 One of the many "one hit wonder" goaltenders in Flyer history. Well done!